Caravaggio's early education in Lombardy gave him a passion for realism and a dislike of idealization; later, in Rome, he would recover that these were revolutionary concepts. The models chosen for saints and supplicants in his religious pictures were revolutionary concepts. The models chosen for saints and supplicants in his religious pictures were genuine peasants with rags, wrinkles and dirty feet. Not surprisingly, this upset orthodox patrons and members of the public alike, who preferred the contrived elegance of mannerism to Caravaggio's down-to-earth observation. 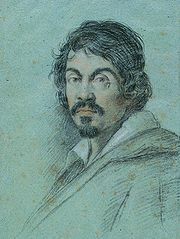 Caravaggio himself very much admired Michaelangelo Buonarroti and paid homage to him several times. The angel's hands in The Inspiration of St. Matthew, painted for the Contarelli Chapel, recalls God's Creation of Adam on the Sistine Chapel ceiling; and in St. John the Baptist (Youth with Ram), the boy poses exactly like one of the ignudi, also on the Sistine ceiling. He combined a short, wild, occasionally criminal life with an iconoclastic attitude. His influence lived on in the studios of the Gentileschi family, particularly that of the remarkably talented Artemisia Gentileschi. Caravaggio's works continue to resonate, specifically with film-makers such as Pasolini, Jarman and Bertolucci. He died of malarial fever in Porte Escole in 1610.